Closing the Bones is a way to support a woman’s recovery after childbirth; a way to celebrate the amazing abilities of your body; and a way to create a moment of stillness, of meditative peace and reflection in the rollercoaster of emotions of new motherhood. It is a postnatal ritual. It is a ceremony. It is a massage with warming, nurturing use of a shawl or scarf. 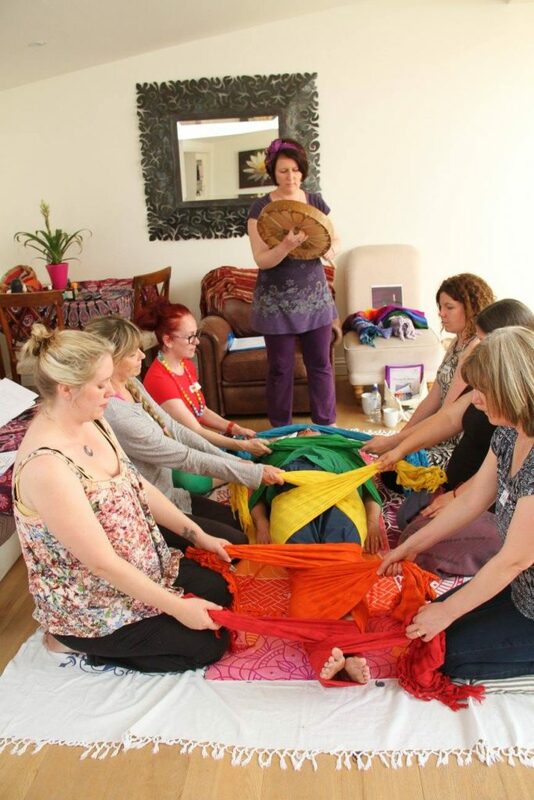 This can be done with one or two practitioners or with the addition of a group of women, who may have celebrated your pregnancy with a mothers blessing before you gave birth. I have been on quite a journey learning about this thing called Closing the Bones. In May 2017 I was drawn to work with Sophie Messager who a few years ago in a beautiful place called Cae Mabon. Deep in the heart of Snowdonia, at a doula retreat, met Rocio Alarcon, an Ethnobotanist from Ecuador. Rocio straddles two worlds; one of the forest, the ancient peoples and the shaman’s rituals, and the fast-paced world of science. Under the gaze of the mountain, next to the babbling Welsh brook, Rocio taught Sophie to honour a woman who has just given birth. Reminded Sophie that a woman’s mind and body need and deserve to be nourished, nurtured and kneaded. Rocio’s gentle hands warmed Sophie and her lilting words guided Sophies in her learning as Rocio modelled the movements to massage a mother’s body. This is such a magical experience to nourish and honour a woman in the very early postpartum days. So I have learned to use my hands to gently stroke my clients with warm oil and to wrap you with the shawl, leaving you feeling soft and warm. To honour your belly and hips, where you grew your baby, is a profound moment, for both giver and receiver. Sophie says that “Many women. Knowing they needed this ceremony to close the circle of pregnancy and childbirth. It is rituals that are the punctuation of our lives; baptism, weddings, funerals. Yet we have nothing to mark the supreme achievement that is motherhood.” This was one of the strongest points that drew me to this work as the light went on in my head this is the missing link as we do not mark this supreme achievement. Through Closing the Bones, or ‘hipping’ as Rocio calls it, I aim to celebrate motherhood and draw attention to the perfection that is a mother’s body. However she birthed her child, this is a time to breathe, reflect on her journey so far and feel loved and supported by her community. This enables grounding and reflection and healing at both an emotional level and cellular level too. Is Closing the Bones a therapy? No. There is no evidence of any therapeutic effect. It is not a recognised therapy and we make no claims that this ritual is curative. It is a relaxing ceremony that women find restorative, meditative and warming. An experienced osteopath attests that Closing the Bones is gentle and safe. I haven’t yet had children? If I’ve had a cesarean? Yes. But the practitioner will want to know that your wound has healed and will be totally led by you. All women are different and everyone will take more, or less, time to find that area acceptable to touch. Be open and honest with what you do and do not want or like. If it’s a long time since I had children? If I have a bad back or other illnesses? Your Bone Closer will expect you to tell them if you are suffering from any illnesses. It is generally accepted that cancer sufferers and other serious ailments are not times to be massaged. If you find it difficult to lie flat on your back for any length of time, you might find things difficult. The price included set up and pack away time outside of the two-three hours booked depending on which package you have booked. Travel cost of 45pence per mile will be added 15 miles from DA12 5PD. I work with a network of bone closers so I will ensure you get the same two practitioners at your sessions when you book the three session packages.